A flat battery is bad news – but how do you replace it safely? A car battery is truly a wonderful thing – until it dies. If it decides to quit and can’t be recharged, you’re stuck on the road until Roadside Assistance or other help arrives. Depending on your driving habits, car batteries typically last between one and four years. 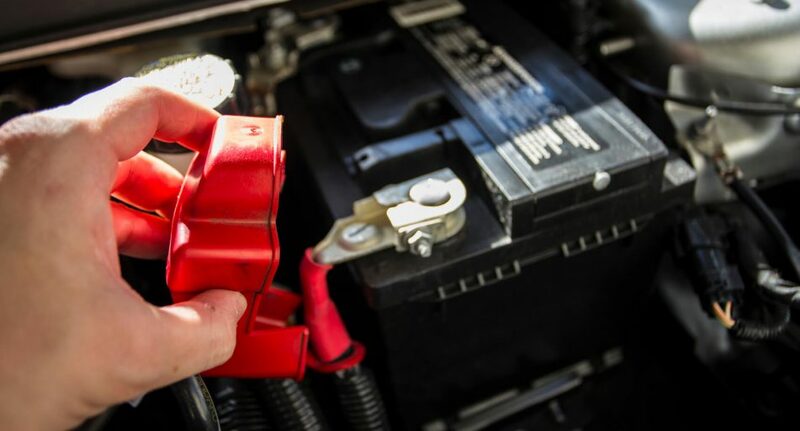 Because batteries are heavy, highly corrosive and potentially flammable as well, many drivers forego the DIY approach and get a professional to replace their dead battery. You’ll need an adjustable wrench, disposable rubber gloves, clean lint-free rags, a little baking soda and water, a battery brush or post-cleaning tool and some safety goggles. Turn off your engine and put the vehicle in Park. Set the parking brake. Spread a towel across your fender to protect the paint from any corrosive acid. Always read your car manual first. For vehicles with a negative ground, loosen the nut and bolt that holds the battery cable clamp to the negative terminal (this will be labelled with a minus sign or ‘NEG’). If your car has a positive ground, you would loosen the positive cable first (your manual will tell you which your car has and the correct order for removing battery cables). Remember where you put the battery screws and don’t let them roll under the car. Wear gloves while carefully lifting out the battery. If the tray underneath is rusty or shows any corrosive deposits, dissolve a little baking soda in some water and use this solution to clean the tray. Don’t do this without putting gloves on first. This is also the time to give your battery terminals a clean. If the tray underneath is rusty or shows any corrosive deposits, dissolve a little baking soda in some water and use this solution to clean the tray. Double-check that it’s facing the same direction as its predecessor and is seated firmly. The battery should now be free of any possible ‘wiggle’. (E.g. in a negative ground car the positive cable is reconnected first). Make sure all reconnected clamps are grabbing the posts in a solid grip. Because batteries are toxic and corrosive they must be disposed of legally and responsibly. Special recycling centres will accept old batteries and charge you a nominal amount to dispose of them for you. Old car batteries do NOT go in your rubbish or recycling bin. Found this interesting? Check out these articles. Your local auto association membership (or the Roadside Assistance that you’ve added to your car insurance) will normally include a battery replacement service, so you could easily go for decades without ever having to change your own car battery. The small amount of money you save by doing it yourself only applies if you don’t ruin your vehicle’s electrical system in the process. The small amount of money you save by doing it yourself only applies if you don’t ruin your vehicle’s electrical system in the process! These days, it’s easy enough to let the pros handle it. You could potentially void your warranty if you attempted to change the battery yourself. To check which items are covered and which are not read your warranty conditions. Don’t always automatically assume that your vehicle problem is due to a dud battery. Your underlying problem may be something else: a faulty alternator or starter motor, for example. A professional diagnostic test can sort out the true cause of the issue. Today’s cars are more technologically complex than ever before and all the modern on-board computers and electrics are susceptible to shorting out. One of the most important steps that professionals take when replacing your battery is to ensure a second power source is available so you don’t lose computer settings and the security code you need to operate the radio. Your radio security code may be written down somewhere in your car manual but if you have no record of it, you’ll usually have to contact your car dealer to get the code again so you can use the radio. Some dealers will charge a fee for this.